Me with Farley, our new mascot. Hang loose Farley! 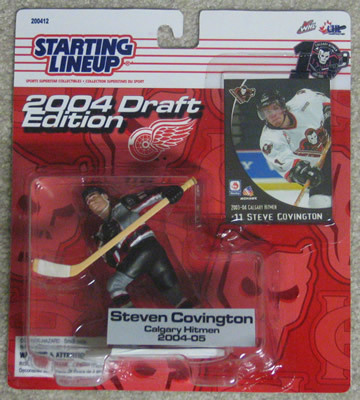 Action Figure #1 goes to Brett Carson for getting drafted this year to the Carolina Hurricanes (#109, 4th Round)..
Action Figure #5 goes to Andrew Ladd for being drafted by the Carolina Hurricanes (#4, 1st round). However, we was playing at the World Junior Championships with Ryan Getzlaf (where they won GOLD!). I did get to give him his figure on Feb 25. Here's the pics from that. This year we had to go to another event right afterwards, so I wasn't able to get my usual photo with each player this year. Perhaps next year we'll have more time and no conflicting events to worry about.